Teresa Gingrave, a native of Portugal, has taken over the helm at McKinley School. FAIRFIELD — McKinley School prides itself on its diversity. In fact, the planters outside the elementary school are filled with the flags of countries around the world. 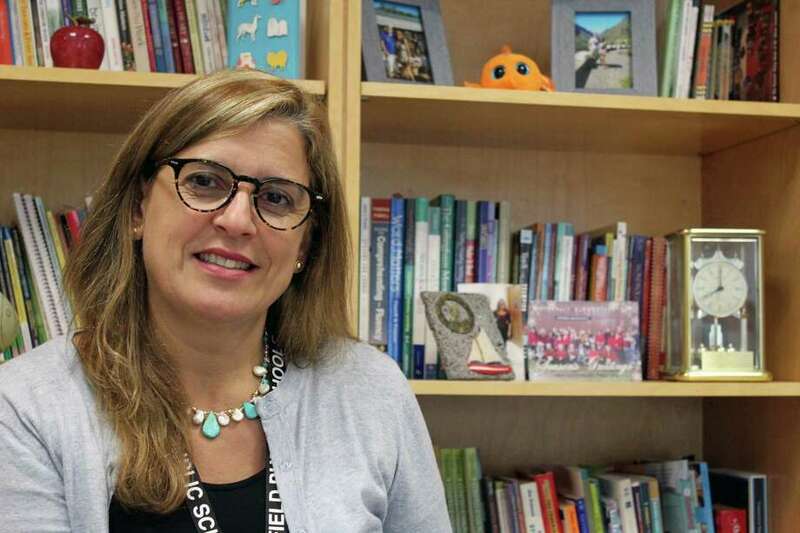 Perhaps it is only fitting the school’s newest principal, Teresa Gingrave, was born in Portugal. Gingrave, who started at McKinley in August, lived in Portugal until she was 16 before moving to Rhode Island. Not only does Gingrave, married and the mother of four, have a bachelor’s degree in biology from Rhode Island College, but her master’s degree from Brown University is in multicultural studies. Gingrave also has an administration degree from Boston University. While she taught science in Rhode Island for many years, the last six years of her career have been spent as an administrator. Gingrave recently answered some questions about her career choice. Q: Why did you decide to enter the teaching profession? A: I come from a long tradition of teachers in my family. Already at a young age, I knew I had the potential to make a difference in a child’s life. The influence an innovative, dynamic teacher has in the classroom has a long lasting impact. For many years I worked to inspire children to be thinkers and advocate for themselves. I practiced with them a growth mindset in approaching challenges and seeing failure as an opportunity to learn. A mindset that allows children to stretch and pursue their dreams. Q: Why make the transition from teacher to administrator? A: As a teacher and a reflective practitioner, I always sought ways to improve and create change. I was not afraid to take risks and innovate. My leap into administration is one example of my desire to not only influence the students in my classroom, but to have a larger role in inspiring teachers, staff, fellow colleagues and the community. Q: What are your initial impressions of McKinley and its diversity? A: I absolutely love McKinley. The staff is dedicated and has a genuine passion for children. They have been extremely welcoming and positive and serve as an inspiration to me on a daily basis. The diversity at McKinley is what initially caught my attention. Having been raised in Europe has afforded me the opportunity to bring a unique perspective to the work. The children of McKinley are an asset to our community. They, too, bring a rich set of values and background knowledge that elevates this school and our community. Here everyone learns from each other. I truly feel we are preparing all children at McKinley for success in a global society where understanding and compassion play an essential role in healthy relationships. Q: Do you miss the day-to-day classroom interaction? A: Yes and no. In my administrator role, I make it a point to visit classrooms every day and interact with children. I often have lunch with children and engage in dialogue that brings out their views and personalities. I feel best when I am around children. Q: What do you think is the single most important attribute needed to be a good, and successful, leader? A: I believe the most respected leadership quality of an effective leader is integrity. This quality is vital to the nourishment, strength, stability and growth of our school. With integrity comes courage, humility, and a honesty that leaves the right impression. As a person I live and lead by these principles. Our McKinley children deserve that.